Well it's about time that we began to learn which is the right Church — of all these churches, of all these church denominations. You know we go along taking them for granted and very few, except to be a little bewildered, once in a while stop to ask, "Which is the right Church and how can we find it? Can all of them be right and all of them disagree?" Now we've been looking into it for a number of broadcasts here, and we have found that the true Church Jesus said, "I will build my church" (Matthew 16:18). And He did build His Church. And His Church we find described in the Bible. And we find that it was the Church that was called, 'the little flock', (Luke 12:32) and nowhere was it called, or was it prophesied to become, a great politically powerful organization or a number of denominations — all of them powerful in this world and all of them having part in this world's affairs. But rather it was a Church that was going to be persecuted; it was a Church that would have customs and practices altogether different from those that we find in the world of the churches today in this world. 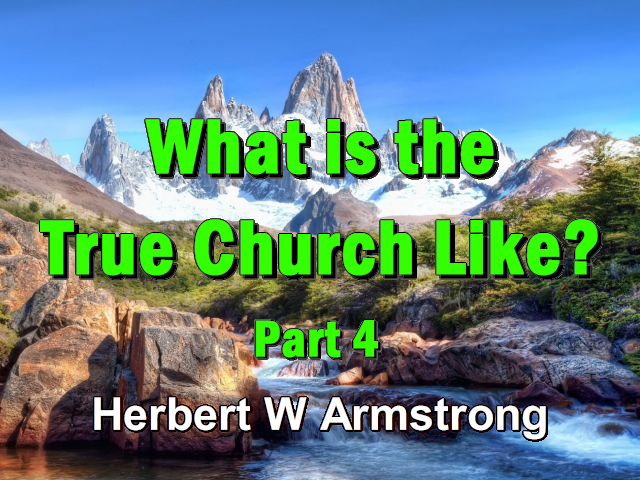 It was a Church that believed exactly what Jesus taught — which was exactly the opposite of the fundamental beliefs and doctrines that are accepted in what we call the 'Christian churches' today. How did these churches that call themselves 'Christian' ever get to have doctrines and beliefs — the things that they believe are true — that are diametrically opposed to that which Jesus Christ taught? I ask you! Now, my friends, there's no use in becoming offended. I just say let's look into this thing and let's see what is the truth. We've been born into this world. We have grown up in this world taking all these things for granted. We sometimes need to pull back the curtain on the mystic past and see how things got this way. We suppose that the churches today are just like Christ started them. And, my friends, they're following customs and practices and ways that are diametrically opposite. The churches today are following the customs, the practices, the ways of ancient paganism — and not that of Christianity, not that the apostle Paul taught to the Gentiles — the Gentile churches raised up by Paul. They all practiced exactly the same thing that Jesus had. They followed in His steps. Today they think they follow in Jesus' steps. But, my friends, they do exactly the opposite. Not in every detail, but in most of the really important and then in so many of the basic principles and the fundamental ways that it's about time we began to look into it. Now the true Church is made up of individuals that are really begotten by God. They're the begotten children of God and they are led by the Holy Spirit. And the Holy Spirit will lead them to believe exactly the same things that the Holy Spirit led Jesus Christ to believe and teach and that the early apostles did and that the churches raised up by the apostle Paul really believed. Now as I said, the last two days we've been on this thing here in the twelfth chapter of Revelation. We find in the twelfth chapter of the book of Revelation, the history written in advance in the form of a prophecy of the true Church — the Church that Jesus did build. I read you, before, the prophecies where Jesus said, and Daniel the prophet said, and Paul the apostle said that the Church would be scattered. We've read in the book of Acts where it was scattered even in that day. I've given you the history of how it was scattered. Now here it is in Revelation. And we found in verse 6 that this Church — along in the very beginning of what might be called, 'the beginning of the Middle Ages,' anyway, it was a few hundred years after Christ — the Church is called a 'woman' here. And 'woman' is a symbol for a church. We've gone into that in the last few broadcasts. And as I've explained, in prophecy, during the time of Israel's punishment, a day is a year being fulfilled. And you find that back here in the fourth chapter of Ezekiel. And back in — I believe now it must be the fourteenth chapter of Numbers back there. But in the fourth chapter of Ezekiel — and also back in Numbers — you find that a day is a year being fulfilled (Ezekiel 4:1-6; Numbers 14:33-34). Anyway, that was during the punishment of Israel. But when we come to prophecies down in our time now in this twentieth century, a day is a day and a year is a year because we find twice here that the Church is persecuted and had to flee — well once she flees and the other time God is going to take her. Now the woman fled. I want you to notice in verse 6 — that's the true Church. Now she was fed on the spiritual food of God. And God had prepared this place and we find the historic evidence of all of that. But now notice after that twelve hundred and sixty years — and that began, well, to tell you the truth, I don't remember the exact date, although we've had it; we've even published it. But, anyhow, it carries us up to the time of the present. Now in verse 9 we find that the dragon is: "That old serpent called the Devil, and Satan [not pagan Rome. The dragon is not any human being at all. This dragon is the Devil]. And who deceived the whole world, he was cast out to the earth and his angels cast out with him" (Revelation 12:9 paraphrased). His angels, like himself, had become perverted in all their ways and they are now demons. Now Michael and his angels fought against the dragon. Michael is an archangel and he has angels with him. And Michael is the archangel that has been assigned to protect and to guard the United States of America and the British Commonwealth of Nations — and also the democracies of northwestern Europe. Now turn back to Daniel and you see the same thing. I read this yesterday, but I want to go into it in a little more detail now. Now coming down to the time which is yet in the future, events that have not yet happened, described between verse 41 and verse 45 of the eleventh chapter of Daniel, the longest prophecy in the Bible. It's a time when the coming revival, or resurrection, of the Roman Empire — a United States of Europe — will plant its headquarters in Palestine, and probably in Jerusalem — at least it'll be in Palestine — and when they're going to hear news coming out of Russia. And it's a time when Russia is going to hurl itself westward and destroy all of Europe! But a lot of other events are going to happen between now and then. Russia is not going to roll over into Europe now — or not in a number of years. Well I don't mean a great number of years, either, because as a matter of fact, if you understand the times, it isn't going to be any great number of years until after the Second Coming of Christ; and this will all precede that. Some of you have attended religious meetings, church meetings of some kind. And the people talk about, "The Lord might come yet tonight;" and, "Are we prepared to meet Him?" Well I was attending meetings like that years ago. And at that time I believed, too, that the Lord might come — even that same night. Well I had a lot to learn yet at that time; I was very young in the ministry. And you know, if we can't keep growing, if we can't keep learning, and if we can't keep unlearning anything that is wrong — we can't continue to grow in grace and in knowledge and we're not going to be ready — that is: we're not preparing for the Kingdom of God and we're not going to be born into it. But we know now, my friends, that a number of things must happen before the Second Coming of Christ. Very great changes are prophesied to happen that must happen to the nations of this earth — a very great thing is to happen to the United States! Do you know what is prophesied to happen to the United States? You ought to be reading this series of articles that is running serially in 'The Plain Truth' magazine; and it doesn't cost you a cent because there is no subscription price. It just so happens that your subscription is already paid for; and it's been paid for by those who believe in tithing and those who believe in giving generous offerings to the work of God. And I don't mean by that that this work is — and let me just say I hardly ever mention that; I never talk about it. Have you ever noticed we never ask for money on the air? So far as I know, this is about the only religious program on the air that doesn't. But sometimes I think an explanation is due our people. They say, "Well who is backing you, anyway?" And sometimes people think it looks a little mysterious and they wonder if some subversive organization or someone might be sponsoring or backing us. Let me just tell you that no one sponsors this work but God Almighty. We have no endowment; we have no organization back of us. But this work started as the work of God. And Mrs. Armstrong and I started this work back in 1934 on the air when we had an opportunity to go on a radio station at the cost of $2.50 per broadcast. Now if you know anything about the cost of broadcast facilities and time, you know that no station could operate very long charging $2.50 an hour today. Well of course that was still in the time of depression and it didn't cost as much then and it was a very, very small station up in Oregon and it didn't reach very many people. It was only 100 watts. I don't know whether there — there are a few hundred watt stations left, I guess in the United States, very few. Hardly any stations are that small today. Almost all of them are at least 250 watts and nearly all of the stations that we are on are 5,000 or 10,000 watts — or 50,000 watts. That's the caliber of stations that this program is being sent out all around the world today — a worldwide program on the most powerful stations on earth. Well we were offered the opportunity of going on the air at two dollars and a half a week. Well we didn't have two dollars and a half a week. And that was the time when I'd been preaching out in a little country schoolhouse and a man said, "Mr. Armstrong, you won't get far." I said, "Why?" He said, "Because you preach the Bible." And he says, "I know this much about the Bible: I know it corrects and reproves people. And the Bible itself says it's like a sharp two-edged sword; that it's going to correct people; it's going to reprove them. And people are never going to support you, Mr. Armstrong." He said, "Nobody's going to give you any money to carry your work on because people won't pay to be criticized and to be rebuked and to be told that they're all wrong." Well you know God tells us we're wrong and the very first thing that Jesus said when He came preaching was, "..REPENT" (Mark 1:15) And the very first thing that the apostle Peter said on the very first inspired sermon — the day the Church of the New Testament began — was, "Repent ye, and believe the gospel" (Acts 2:38) That is the first thing he said when they asked him what to do. And the apostle Paul preached, "Repentance toward God, and faith toward our Lord and Savior, Jesus Christ" (Acts 20:21). And the way to find God is to "forsake YOUR way and your thoughts because they're not God's ways or God's thoughts." (Isaiah 55:7-8 paraphrased) You find that in Isaiah 55. And that's the way to find Him. And that is to repent — repent of our way because sin is the transgression of the law. Well anyway, Mrs. Armstrong and I sent out letters way back there in 1934. And it was in the fall — late fall of 1934. And we sent letters to a few people that we knew and told them of the opportunity. And you know we had offers to support the program for a year from people that we knew had really repented and surrendered to God and loved the truth of God. And there weren't very many; we didn't know very many. But we had an offer amounting to a dollar and a quarter a week that would carry us through for half of the cost. But we had to raise two dollars and a half a week. Well you know we said that we would trust God to send the other dollar and a quarter a week. And we started the broadcast the first Sunday in 1934 that has never missed a Sunday since and has carried on never missing one week up till now. Now, of course, we never miss a day; we're on the year round everyday now on very powerful stations covering the United States and going around the world every Sunday. And we have never missed a one. But I want to tell you it took a lot of faith. We always paid every Sunday in advance before we went on the air. I remember one Sunday morning. We came down to about 20 minutes before broadcast time. And we had to leave and hurry down to the station, but we didn't have the money. And how were we going to go on? And Mrs. Armstrong and I squeezed into a little closet and asked God to send the money. And right then there was a knock on our front door. A man had stopped with a motorcycle. He said, "Here, I'm in a hurry; I've got ten dollars tithe I want to leave." And he dashed on out and hurried. And we took the ten dollars and went down and went on the air. When we finally were growing where we were on a station in Portland and we had to drive a car to Portland every Sunday for the broadcast from Eugene, Oregon where we lived. I remember one Sunday we didn't have the money to go on the air in Portland. We started anyhow. We had to stop and see some friends on the way for something, but they were not the kind of friends that would ever give us any money. But for some reason they or some visitor was there; and I don't remember what it was. But anyhow the money was given to us on the way. And by the time we got to Portland we had the money and went on the air. This work has been a work of faith — trusting in God from start to finish. That man that told me that we would never go far reminds me of a man on 'Grand Ole Oprey' that heard a phonograph record one time and it wasn't quite his kind of music — it was, maybe, a kind of crooning, but it wasn't his type of hillbilly. And he said, "Who's that there feller?" And someone said, "That feller's name of Bing Crosby." And he says, "Hmmm, he'll never get far." Well this man said I would never go very far and he said people will not support the truth because the truth cuts people and it reproves them and they don't like it. You know Jesus said, "This is the condemnation, that light is come into the world [which is truth which He brought] but men loved darkness rather than the light" (John 3:19). And that's true. Well I answered to that fella, I said, "We're not depending on men to support this work; we're depending on God Almighty." And I said, "We're not going to have to ask men for it, unless we know they're the children of God and in God's work." And I said, "Then, as a minister, it's my duty to tell them of their need to support the work of God. That's another part of the ministry." Ancient Israel set us an example: Moses, when he needed money, told Israel about it. And they gave money so generously that he had to send out a proclamation restraining them from giving so much. And then the apostle Paul asked the churches for money when they needed it and told them what they ought to do. He didn't ask for it for himself, but he did for other purposes. And he certainly taught them the truth about how tithing is ordained. You'll find that in the ninth chapter of I Corinthians. And you'll also find what he wrote about the tithing law on the money going to the ministry of Christ in the seventh chapter of Hebrews. And that is part of the gospel message; and I preach the message once in a while because it is the gospel message. But we don't ask the world for money. Jesus said, "Go into all the world and preach the gospel." (Matthew 16:15) He said, "Freely you have received [of the gospel]; freely give" (Matthew 10:8). The gospel must be given; it can't be sold! The literature that we have that proclaims the gospel is never sold. It should not be sold like merchandise. We can't put a price on it. That's why I say, "You haven't got enough money to buy a year's subscription to 'The Plain Truth.' We can't put a price on the gospel — it's free; it goes free! And you know we have just trusted God from the beginning. And we get on our knees and ask God Almighty when we need it. And somehow He has a way of sending it. And this work has grown; it has multiplied in dollars and cents. After the end of the first year — by the end of nine years it had multiplied thirty times over and by the next nine years it had multiplied thirty times that! And that's the way God's work keeps growing and going because it's like the grain of mustard seed; and anything by faith is that way, my friends. It starts small — the smallest of anything. And I don't know any radio broadcast that started as small as this one, but it has grown and grown simply through faith. There are enough people that God lays it on to recognize the truth to take care of God's Work. You don't know the need, sometimes, and how our faith is tried and...but we've learned to quit worrying about it. We just trust God. But sometimes we have to begin praying a little bit harder, I'll tell you that. And just been in to one of those times, too, and we know what it is; but God always does take care of it. He always does. Well now to get back into this — well I was going to say you surely want to read this article in 'The Plain Truth.' Now many of you have not. You've been thinking about it; you just haven't written in for it. I want to just say this now: the most important thing for you to read, that you can possibly get, or that you've had in your lifetime is to know what is prophesied to happen to the United States! It's going to happen before the Second Coming of Christ. And I want to tell you it's the most colossal world event that has ever shaken this world yet. And I want to tell you that World War I and World War II were little tiny things — little firecrackers — going off by comparison. It isn't any little thing. This is not just some sensational thing. This is something real and it's going to hit you and it's going to affect you and your family and your household. And I want to plead with you with all the sincerity that I have, my friends. You'd better know and be prepared because it doesn't need to strike you, but I'm telling you by the authority of Jesus Christ it will — if you're indifferent and if you just neglect it and if you don't care. Now get your name on the mailing list; read this series of articles, 'Where is the United States Mentioned in Prophecy?' There'll be a number of installments on that, first. And as soon as you've found out where the United States is mentioned in prophecy, the most fascinating, the most interesting story you ever read — in or out of the Bible — then you're going to read the prophecies that do pertain to us of what is prophesied to happen. I want to tell you it's the most startling, the most astounding prophecy of all time. And it's the most important thing in your life. Now listen: there is going to be an invasion later — after this thing happens to the United States — of the Russians going into Europe. And that is going to cause the headquarters of this European combine that is now under way and rising up — and we've sent men to Europe; they've seen it over there — they're going to move their headquarters over to Palestine. "Then shall be GREAT TRIBULATION, such as was not since the beginning of the world to this time, no, nor ever shall be. [that's the same time. Now notice, He said]... except those days should be shortened, no flesh should be saved: but for the elect's sake those days shall be shortened [and above He had said]. They shall deliver you up to be afflicted and killed" (Matthew 24:21-22, 9). You...and 'you' means the saints — and it also means our people — nationally. There's where many of them are put to death. This thing is the wrath of Satan the Devil; it's on the Church! The Great Tribulation is not something the Church is raptured away out of before it happens. The Great Tribulation is coming on the Church. You've been hearing a lot of false teaching and false doctrines. And I tell you, my friends, you'd better blow the dust off your Bibles AND STUDY THEM FOR YOURSELVES and see who's telling you the truth! Now just because I tell you that this rapture theory of — a secret rapture before the Great Tribulation is false, don't take my word for it. But I do say, open your Bible and begin to study it for yourself and see where the truth really is. Now notice "Therefore rejoice, ye heavens, and ye that dwell in them [but]. Woe to the inhabiters of the earth and the sea! For the devil is come down unto you, having great wrath [whose wrath? the Devil; this is the wrath of the Devil. The Devil is causing this tribulation because] he knoweth he hath but a short time. And when the dragon saw that he was cast unto the earth, he persecuted [who?] this woman [this Church — the true Church that Jesus built. It's the one the devil is wroth with; it's the one the Devil is angry with; it's the one the Devil is persecuting] brought forth the man child [Christ]. And to the woman were given the two wings of a great eagle, that she might fly into the wilderness, into her place, where she is" [to be for — now this is a literal three-and-a-half years]. Which Church is this, the Devil is so angry with; which Church is it he's persecuting? The one that had to flee into the wilderness — not great organized powers, not all these sectarian denominations and divisions. But, verse 17 "The dragon [who is the Devil] was wroth with the woman [the true Church of Christ] and went to make war with the remnant [that's the last generation] of her seed, which keep the commandments of God, and have the testimony of Jesus Christ" (Revelation 12:17). It's the Church that keeps the commandments of God and has the true testimony of Christ. And, my friends, write for the booklet on 'Easter.' and know the truth about Easter and where it came from. That's a custom the churches practice that Jesus didn't — and the early Church didn't. The resurrection was not on Sunday; it was on another day of the week. Write for our booklet on the 'Resurrection.' — and also the booklet on 'Easter.' You can't afford to go on taking things for granted. The whole world has been deceived.